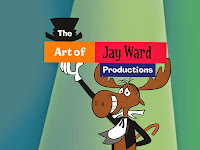 Pre-order The Art of Jay Ward Productions! Although the book won't make its official debut until November 15th at the CTN Animation Expo, you can now pre-order the book at www.artofjayward.com. Local purchasers can be the first to get their hands on this long-awaited book by pre-ordering the book and picking it up at Renegade Animation's Glendale office, see the book's website for more info. If you order it before Oct. 15th and use the code EARLYBIRD, you'll save $10 off the publication price. More page images and order information can be found here.